Once upon a time, Shake tried to make bacon-infused bourbon. 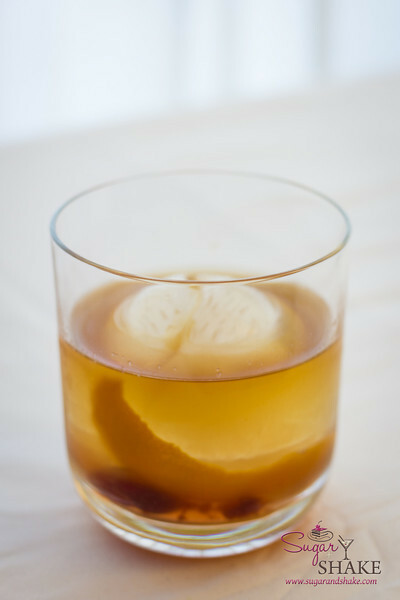 A friend had told us about the recipe from PDT and their famous Bacon Old Fashioned. We were having a cocktail party and Shake decided he wanted to make this drink for everyone. We gamely fried bacon, chilled it, strained the fat and served up the Old Fashioneds. It was pretty good, everyone agreed. It just didn’t seem that bacony. More recently, Shake decided he wanted to try the bacon bourbon thing again. “But I want it to be smokier. Baconier,” he said. He found a new recipe for bacon-infused bourbon. 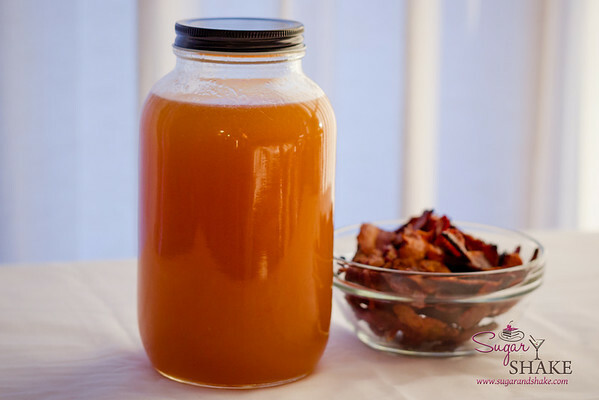 This one, by Matthew Walrath of the bacon-focused site What Is Bacon, calls for a lot more bacon grease and a much longer infusion time. Also, some vigorous shaking. Unfortunately the first batch I created, following the guidelines as closely as their vague descriptions would allow, tasted as if I had done NOTHING to the bourbon. 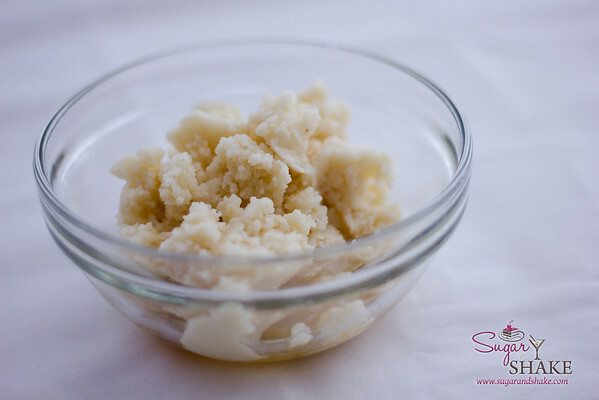 I wasted 1/3 cup of high-quality lard in the process. So, rather than follow their conservative recommendation to add 1/3 cup of bacon grease to the bottle of bourbon and promptly put it in the fridge, I decided to make the following changes: more bacon, more time. Smart guy. I highly recommend you check out his site because he has way more step-by-step photos than I’ve got here and some entertaining writing. Plus, y’know, tons more on bacon. It all starts with bacon. The original PDT recipe calls for 3 to 4 slices of bacon, one solitary ounce of rendered fat. Walrath instructs you to cook up ¾ pound of bacon to yield ½ cup of fat. I used 8 slices (I want to say that I used nearly the entire package, but not quite) of a thick-cut smoked bacon. I honestly don’t remember what brand it was, but it was something pricey Shake picked out at Whole Foods. The better the bacon, the better the end result. 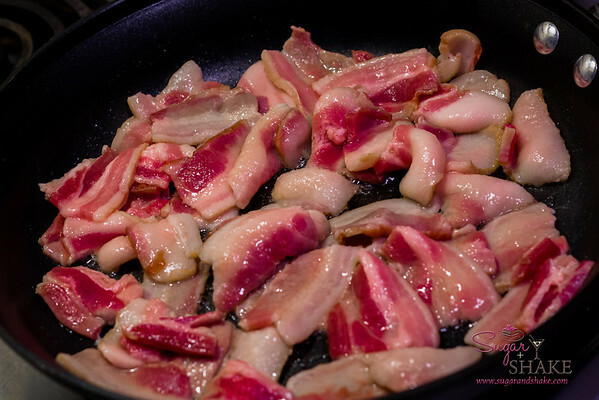 A chef told me recently that to yield the most rendered fat, you should start your bacon in a cold pan, not throw it into an already hot pan. (If you do that, he said, less fat will render out.) I did not do this. I still managed to get an even ½ cup out of my 8 slices. You’ll also need a full 750ml bottle of bourbon. What you use is totally up to you, but it really ought to be something you enjoy sipping. 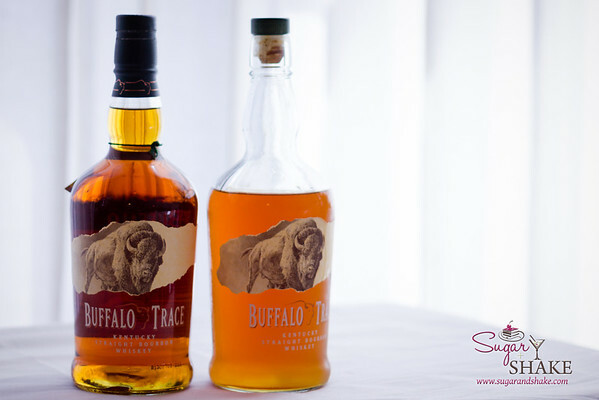 We like Buffalo Trace. It’s sort of our “house bourbon.” It’s not terribly expensive, but it’s also a fine quality—something you can sip by itself but also don’t feel like you’re defiling it by mixing cocktails with it. Remove all the bacon pieces from the pan and set aside before carefully pouring the grease into the bourbon. 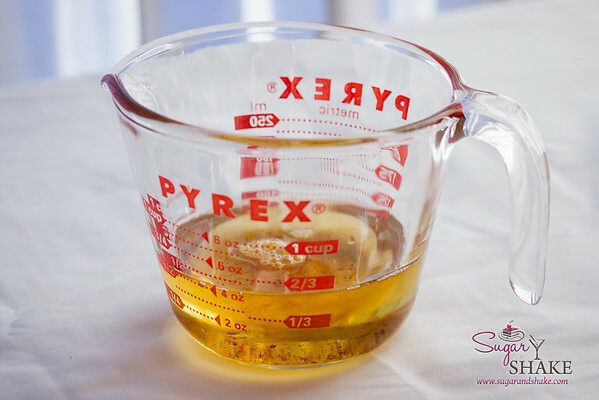 I suggest transferring the fat to a glass measuring cup so you can a) check to see that you have around a half-cup and b) make sure you don’t spill any of the grease. It also helps it cool down a bit so you’re not just throwing hot grease into room-temp bourbon. 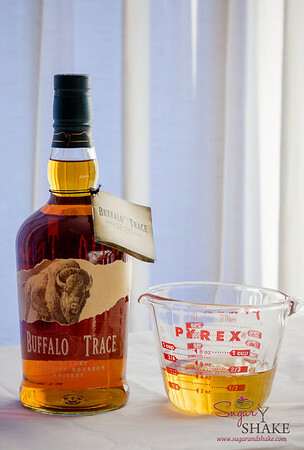 When it’s shaken, the bacon fat–bourbon mix will look cloudy. Eventually, the fat and the liquid will separate again into layers. Now, the original PDT recipe directions indicated that at this point, you should stick the jar in the fridge or freezer, chill until the grease solidifies and pull out the resulting clump-o-fat. Walrath instead advocates a much longer infusion time: He says three days, sitting out at room temp. I took a few in-progress photos; you’ll find them on the Sugar + Shake Facebook page. Post by Sugar + Shake. So here’s where that “use a jar with as wide a mouth as possible” thing comes into play. Carefully remove the solidified fat—I advocate saving it, but if you think it’s disgusting, go ahead and toss it out. Don’t blame me if you regret it later. Try to get it out in one or two pieces. Slicing it with a knife is preferable to just willy-nilly hacking at it with a spoon or fork. What you don’t want is to break it into tiny little floaters. If your house is as hot as ours is, tiny pieces can start to liquefy pretty fast and you don’t want to go back to the oily stage. Once you’ve removed as much solid fat as possible, strain the bourbon through a coffee filter-lined strainer (mine’s big so I overlap two filters in the bottom to prevent leaks out the side). I find it easiest to strain into another big container that has a pour spout, like a four-cup measuring cup. Finally, pour the strained bourbon through a funnel back into the original bottle. Voila, bacon-infused bourbon. It’s not likely you’ll mix it up with the regular stuff, since it retains a more opaque hue than non-infused bourbon, but you might want to label it anyway. You’ll notice that the angels have taken a VERY large share for themselves. Greedy bastards. I guess they like bacon. I honestly have no idea if this is normal; Walrath doesn’t mention it in his post. What I do know is that a great deal of that bourbon is now in those fat curds you set aside for later. You did, right? I mean, I’m not the only one with a bowl like this in the fridge? If you did, you can use it to fry up all sorts of things—I made potatoes the next day for breakfast. The house smelled like a bar at an obscenely early hour, but our neighbors aren’t really the judgey type. Because there’s some water content in the fat (from the bourbon), it does spatter a bit. Don’t cook nekkid. I’m planning on using the rest to make Bacon Bourbon Granola. Stay tuned for that project. This was originally Shake’s project, but it turned into mine. I’m the official bacon maker of the house and the way things turned out (he had to work over the weekend and I started to feel weird that we had fat blobby bourbon sitting around for a week), I also ended up finishing the process by myself. To celebrate, I made myself a Bacon Bourbon Old Fashioned and had some freshly baked Salted Shortbread Cocktail Cookies to go with. 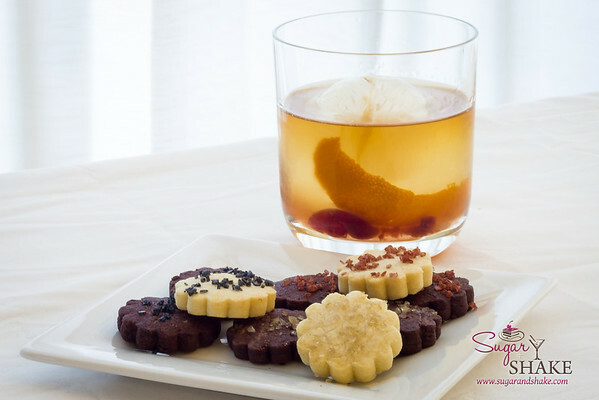 They pair very nicely—the sea salt is a nice complement to the bacon flavor and the cocoa plays against the slight sweetness of the bourbon. Want to do it yourself? Here’s how. 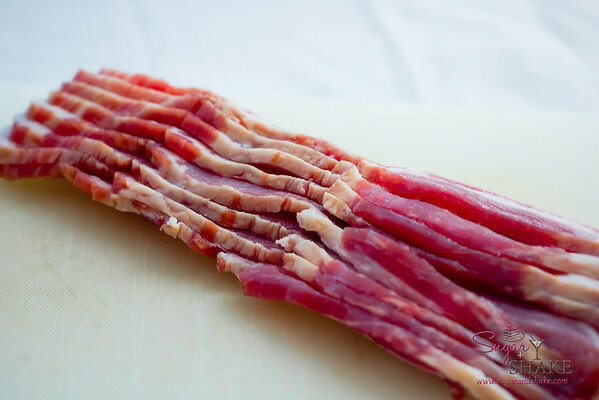 Slice bacon into 1-inch slices and pan fry to render out the fat. 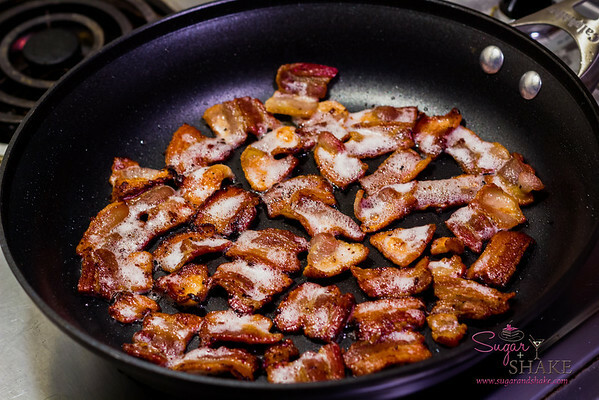 When bacon is crisped and as much fat has been rendered out as possible without burning the bacon, remove bacon from pan. 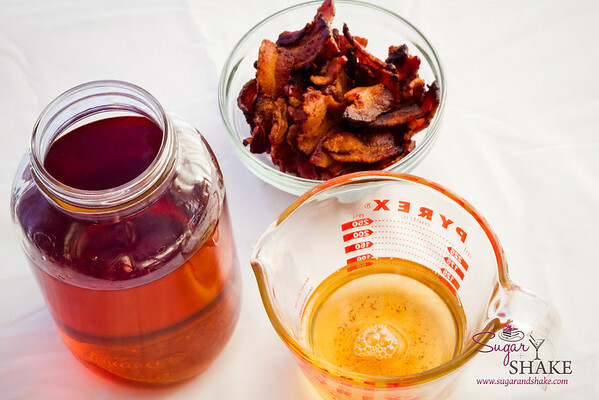 Pour rendered bacon grease into a measuring cup to verify you have approximately ½ cup of rendered fat. (A little more or little less won’t hurt.) Allow to cool slightly—the side of the measuring cup should be just warm to the touch. Empty bourbon into clean mason jar. Refrain from sampling. Save empty bourbon bottle. Gently pour rendered bacon grease into bourbon. Try to avoid getting any “floaties” in the bourbon. Close jar tightly and shake vigorously. Shake jar every 4 to 8 hours (at least twice a day) for up to a week and at least two days. Refrigerate for at least three hours to allow the fat to solidify. 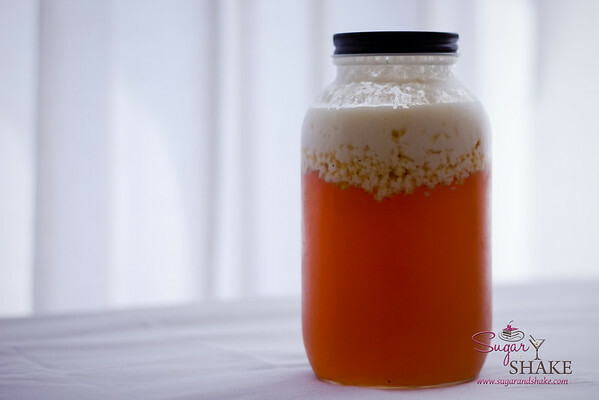 Remove solidified fat from the top of the jar. 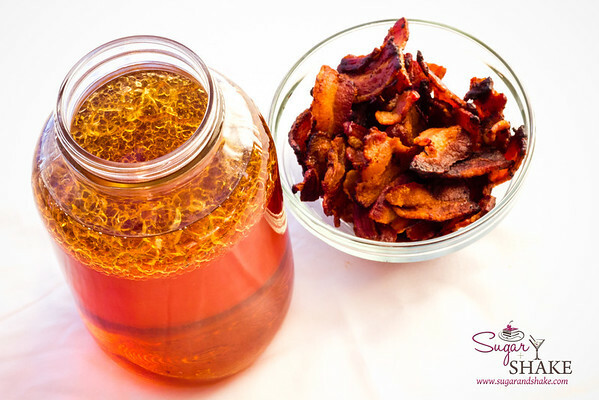 Strain bourbon through a coffee filter-lined strainer to remove any remaining bacon bits and lingering fat. Transfer strained bourbon back into the original bottle. Sip neat or turn into a bacon-ized version of your favorite cocktail. Muddle cherry, bitters and simple syrup in an old fashioned glass. Peel orange over the glass and drop the peel in. Lightly press peel a few times with muddler to extract oils. Add bourbon and ice. Stir with a bar spoon. OK, I wanna know: Who here, besides me, would keep the fat?